On May 12, 2015, two big events occurred in the digital universe. The New York Times announced the end of a six-decade tradition, the “Page 1 Meeting,” and Verizon bought AOL for $4.4 Billion. The infamous New York Times Page 1 Meeting was where the editors from each news desk “hashed out the day’s top stories,” which concluded with the list of articles for the next day’s front page edition. Verizon bought AOL for that company’s ability to supply mobile content integrated with advertisements to hand-held devices such as smartphones and tablets. AOL’s content may or may not be worth it, but offering Verizon a mobile ad platform for text and video makes both companies competitors in the Google-Facebook-Yahoo marketspace. On May 12, 2015, it was Digital Media 2:Print 0. Both of these events are foreshadowed by Words Onscreen: The Fate of Reading in a Digital World, Naomi Baron’s latest entry in the field of writing, linguistics, and e-media. Baron, Professor of Linguistics and Executive Director of the Center for Teaching, Research and Learning at American University, is a well established presence in the academic world, and with recent writings has sought a hybrid approach to these complex areas. 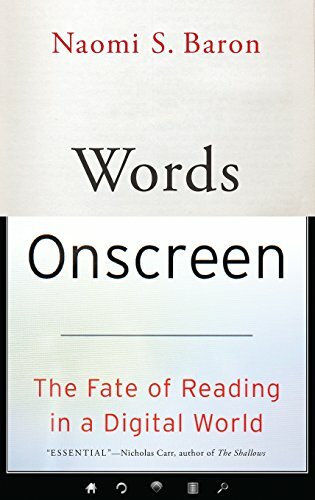 Thus Words Onscreen is a popular book about e-reading and ebooks supported by scholarly research, examples, and stories as well as contemporary surveys, events, and anecdotes. A very interesting and worthwhile book, Words Onscreen does not quite fulfill its promise as a popular book about this aspect of digital media, in part because it is not tightly focused enough on the main question: “Does it matter what medium we use for reading: print or digital text?” Words Onscreen spends too much time getting to that point, and then doesn’t really prove it beyond what we already know, i.e., that shorter texts work best on screen, and longer texts work best in print, both for comprehension and presentation. Navigating her way to this conclusion, Baron uses her background and offers considerable research on the history of print and reading to interest the reader. But the background is not quite synthesized the way that it needs to be, that is, wrapped up neatly to present a set of facts to support conclusions. For example, in the space of less than a few chapters, the author covers a plethora of topics which oversaturate the reader’s understanding of the main points, including: 17th century encyclopedias, the development book pagination after the printing press, 18th century London coffeehouses (for book discussions), serials, magazines, the 20th century Reader’s Digest of condensed books, the Book of the Month Club, and Cliffs Notes. After posing the question again around page 100: “Does the medium matter?” and concluding that no one has done “comparative studies,” the author takes a deep breath and continues to explore a new host of diverse topics, such as the Find/Search command and its role in reading, Green/Eco Book,; e-textbooks and economics, PowerPoint, marking-up texts, Librarything.com, Oysterbooks.com, blog book tours, Oprah’s book club, Shindig.com (video book tours), Smellofbooks.com (which can’t be real, can it? ), and Librify.com (social reading). Baron underplays the economics of e-texts, and fails to explore the deep aspects of social reading that social media has elevated to a place far greater than even the best 19th century London coffeehouse could hope to achieve. E-reading on a standalone device, and e-reading connected to the Internet, have different characteristics, and needs to be explored carefully to understand the differences in what can be an offline, private, quiet world and what is usually a connected, distracted world. The Words Onscreen’s impressive bibliography, including M. T. Clanchy’s From Memory to Written Record, Robert Darnton’s “History of Reading,” and David Landes’ Revolution in Time, are all excellent works in their areas and bring much to the table. But two authors are conspicuously absent: Elizabeth Eisenstein, The Printing Press as an Agent of Change, which would have helped to frame this communications shift as it did for the printing press; and Marshall McLuhan, The Gutenberg Galaxy and Understanding Media, both of which would bring out the qualities of different media and demonstrate the idea of multitasking from a different perspective. Janet Asteroff, Ed.D., is a business and technology writer and analyst working in communications and the social sciences.